Earn free products with our rewards program. 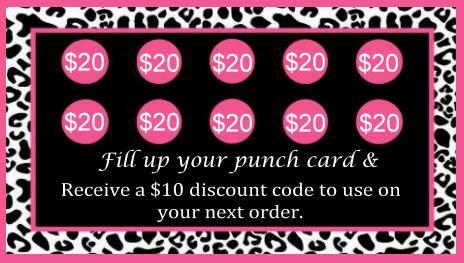 Earn one "punch" for every $20 spent on our website. After you rack up 10 punches you'll receive a $10.00 discount code for free products! Sign up today and we will add your card to this page. Fill out the form below. Place an order for $20 or more here on our website. Your orders must be of regular pricing. No large sales or wholesale orders qualify for this program. VERY IMPORTANT: Click the "update rewards card" option during check out and we will update your card as soon as your order is processed. Visit this page for current punch totals. If you do not see an update on your card within 24 hours please let us know. Once your Punch Card is filled, you can use the $10.00 off on your next purchase. We will email the $10 discount code to use when your punch card is filled. Shop and fill up your cart with any products listed on our website. Upon checkout enter your discount code to receive $10.00 off. Click “recalculate” before you pay. If you use a discount code which brings your total below $20, your order will not count towards a punch on your card. Multiple orders less than $20 cannot be combined to earn a punch on your card. Punches are awarded upon order completion and are valid on future orders. Punches earned during an order will not be available for use on that order. We cannot back up on previous orders to give punches towards your reward. We reserve the right to discontinue the rewards program at any time. Punches are earned on every $20 ordered. Order $40 - earn 2 punches - $60 earns 3 punches, etc. Once your punch card is full and we have emailed your discount code we will post a brand new card so that you can continue earning new rewards. After we receive your request a punch card will be added with your name on it. Start shopping immediately and earn your reward!